Ogata Gekkō (尾形月耕, 1859 – 1 October 1920) was a Japanese artist best known as a painter and a designer of ukiyo-e woodblock prints. He was self-taught in art, and won numerous national and international prizes and was one of the earliest Japanese artists to win an international audience.  He was born as Nakagami Shōnosuke (名鏡 正之助) in Kyōbashi Yazaemon-chō in Edo (modern Tokyo) in 1859. His father, tradesman Nakagami Seijirō (名鏡 清次郎), died in 1876, and Gekkō took to work in a lantern shop in Kyōbashi Yumi-chō. Gekkō was self-taught in art, and began decorating porcelain and rickshaws, and designing flyers for the pleasure quarters. 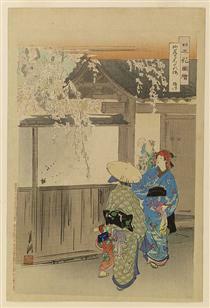 His early style shows the influence of the painter Kikuchi Yōsai. 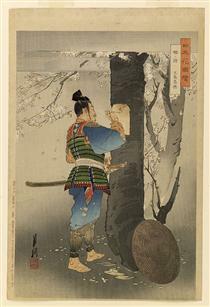 About 1881 he took the surname Ogata at the insistence of a descendant of the painter Ogata Kōrin. He soon was designing prints and illustrating books and newspapers. 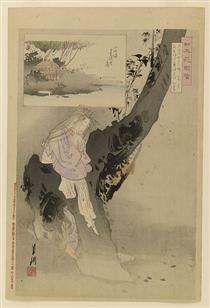 In 1885 Gekkō exhibited in the Painting Appreciation Society, and he became acquainted with the art scholars Ernest Fenellosa and Okakura Kakuzō. 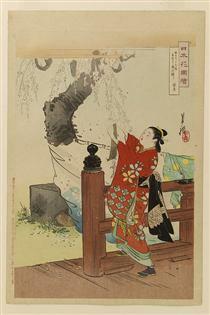 In 1886 Gekkō produced the print series Gekkō Zuihitsu (月耕随筆, "Gekkō’s Random Sketches"). 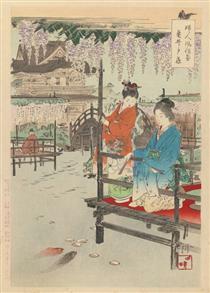 In 1888, he married an art student of his, Tai Kiku—his second marriage—and changed his family name to Tai. 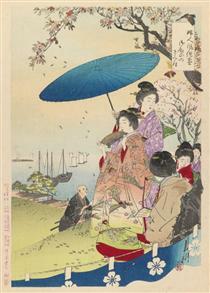 He was a judge in the Japan Youth Painting Association (ja), which he helped found in 1891. 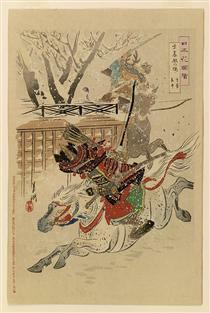 The First Sino-Japanese War was the subject of a number of triptychs he designed in 1894–95. 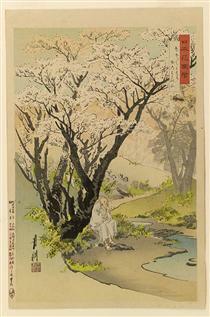 From the 1890s Gekkō won a number of art prizes, both national and international. 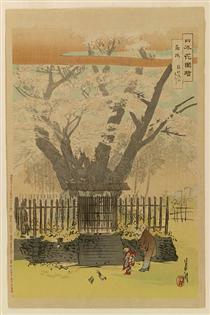 He was one of the earliest Japanese artists to win international attention. At the World's Columbian Exposition in Chicago in 1893 he won a prize for Edo Sannō matsuri (江戸山王祭, "Edo’s Sannō Festival"), and in 1904 he won the Gold Prize for the series Fuji hyakkei (富士百景, "One Hundred Views of Mount Fuji") at the Louisiana Purchase Exposition. His work was exhibited at the Exposition Universelle in Paris in 1900 and at the Japan-British Exhibition in London in 1910. 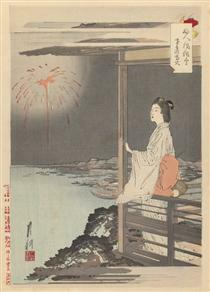 In 1898 at the Japan Art Association, Emperor Meiji bought his painting Soga yo-uchi (曽我夜討, "Night Attack of the Soga"). He won third prize at the sixth Ministry of Education Art Exhibition (ja) in 1912. 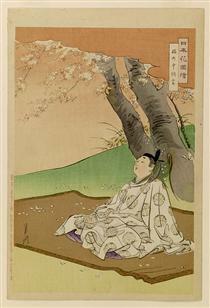 Gekkō died on 1 October 1920 in Shin-Ogawamachi in Ushigome Ward of Tokyo at age 61. 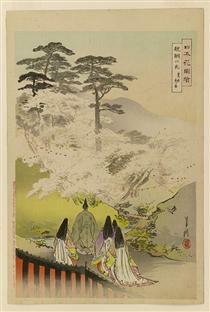 His art names include Kagyōrō, Meikyōsai, Kiyū, and Rōsai. 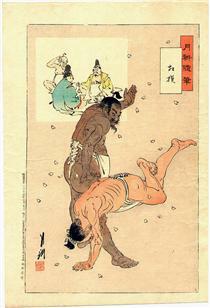 He had few students, the best-known of whom was Kōgyo Tsukioka, the adopted son of Yoshitoshi. 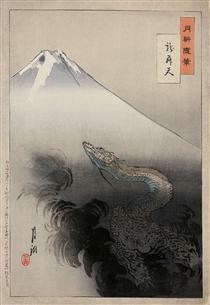 His work was originally closely based upon that of Kikuchi Yōsai; and he was inspired by Hokusai, creating a series of one hundred prints of Mount Fuji. 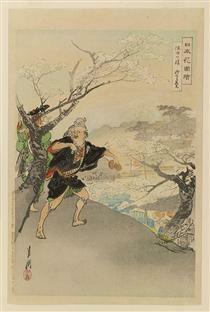 However, he did develop his own style, with significant stylistic elements from nihonga. Gekkō was among the artists whose artwork informed the Japanese populace about the progress of naval and land war known today as the First Sino-Japanese War of 1894-1895. 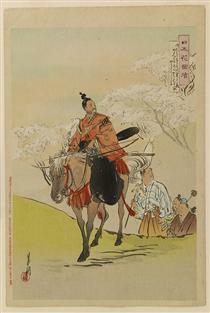 A number of Gekko's war images were published in Seishin Bidan by Yokoyama Ryohachi. An impression of the Haiyang Island (Kaiyoto) Naval Battle in 1894 was prepared in a large-scale quadruptich format.